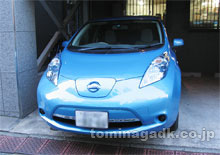 We have begun use of the Nissan Leaf. As a business vehicle for our company, we have begun use of the Nissan “Leaf,” which is an electric vehicle that uses no gasoline. In addition to emitting no CO2, it does not produce any nitrogen oxides. At our company, we will continue striving to reduce the burden on the environment. Used items such as copy paper are usually disposed of as business waste, but participating in the neighborhood association allows for recycling in the same way as resource collection. In addition to used double-sided copy paper, colored paper (envelopes, magazines, candy packaging, etc.) is also collected as a recyclable resource, allowing for collection of unwanted paper products from sources such as deliverables from trade partners. Also, collection is categorized with the top two layers of the collection box dedicated to black and white paper, and the bottom two layers dedicated to colored paper. Thanks to the cooperation of our customers, reusable containers are used to make deliveries, eliminating the previous need for new cardboard boxes to be used for each individual delivery, reducing the volume of cardboard boxes used. By changing the way packaging tape is used to avoid overuse of packaging tape, the amount of packaging tape used has been reduced. Cardboard boxes used when making deliveries to customers are carefully selected for reuse. Packaging material has been reduced through use of PP bands. Resources such as plastic bottles, bottles, and cans are taken to recycling centers and reused. In addition, bulky items such as instant food containers and used PP bands are reduced in size through processes such as crushing and cutting, reducing the volume of waste and conserving use of garbage bags. Thermostats for air conditioning during the summer months are set at 27 degrees Celsius, heating during the winter is set at 22 degrees Celsius, and no air conditioning is used during the spring and summer, instead relying on opening of windows for ventilation. In order to provide a uniform temperature indoors, each floor is equipped with numerous fans, and the power for these fans is provided by solar panels installed on the roof. Effective use of the sun’s energy is provided by solar energy units installed on the roof of the company building. Power for lights for display panels placed in the greeting area of the company building and fans used within the company is provided by solar energy units. Beginning with indoor lighting turned off during lunch breaks and PC monitor power switched off, PC monitor power is switched off during extended times away from desks for meetings, conversations, or other reasons, including leaving the office. Numbers are assigned to light switches, and each department manages their use according to current lighting needs. For refrigerators in use located on each floor, use of refrigerators on odd-numbered floors is suspended between the months of October and May, and temperature settings for the remaining refrigerators in use are turned to low settings. By periodically holding seminars about environmental issues, we are working toward increased recognition of environmental issues by all employees.